Macao, Oct 27 (IBNS/NITN): The World Tourism Organization (UNWTO), in partnership with the Global Tourism Economy Research Centre (GTERC), presented its Asia Tourism Trends Report on Wednesday at the Global Tourism Economy Forum in Macao (China). The report shows Asia and the Pacific outperforming all world regions in growth in international arrivals since 2005. 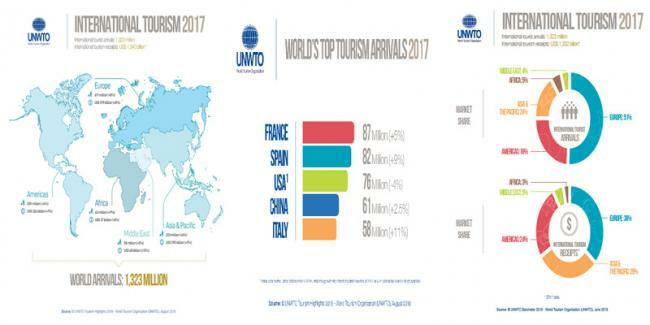 ‘UNWTO/GTERC Asia Tourism Trends – 2018’ shows that international tourist arrivals in Asia and the Pacific grew 6 percent in 2017 to reach 323 million, around a quarter of the world’s total. Of all world regions, Asia and the Pacific, the second-most visited after Europe, has grown the fastest in international tourist arrivals since 2005. Arrivals increased an average of 6 percent per year, above the world average of 4 percent. Rapid economic growth in a region with over half the world’s population, coupled with rising air connectivity, travel facilitation and large infrastructure projects, have boosted international travel in the region. This has had a large impact on Asian destinations’ tourism earnings, which have steadily increased from 17 percent of the world total in 2000 to 29 percent in 2017. This is equivalent to US$ 390 billion in tourism receipts. Asia and the Pacific plays a vital role as a source market as well, fuelling much growth in both regional and long-haul destinations. The region produced 335 million international travellers spending US$ 502 billion in 2017, 37 percent of the world total. Around 80 percent of these visits were concentrated in Asia destinations. Outside the region, 56 percent of the long-haul trips were to Europe. To celebrate the EU-China Tourism Year 2018, the report looks at international tourism between China, the largest economy in Asia, and the block of 28 European Union (EU) countries. It finds that 5.7 million Chinese tourists travelled to Europe in 2016, of which 3.5 million went to the EU. In reverse, 5.5 million Europeans travelled to China in 2016, 3.1 million of whom from EU countries. The last chapter of ‘UNWTO/GTERC Asia Tourism Trends – 2018’ provides an insight into the Greater Bay Area of China, a project to create a large socio-economic zone and tourism area comprising the two Special Administrative Regions of Hong Kong and Macao, as well as nine cities in Guangdong Province. According to the report, the Greater Bay Area is China’s fastest-growing tourism region and the Pearl River Delta home to several cities with high tourism development including Guangzhou, Shenzhen, Zhuhai and Foshan.